School books its place in history | The Dacorum Heritage Trust Ltd.
Heath Brow School once occupied the site of Hillside, a private house in Heath Lane, next to the former Vicarage. The house was used firstly for educational purposes by Montagu Draper, from 1872 -1874, whilst waiting for his brand new school at Lockers Park (a boys’ boarding and day preparatory school) to be finished. 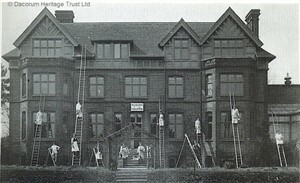 South Lodge, on the corner of Charles Street, was once used as accommodation by the teachers for Lockers Park School. 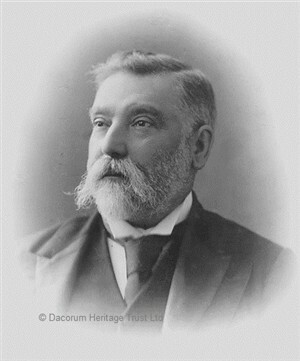 Walter Dowling was born in Westminster, Middlesex, in c.1845 and came to Hemel Hempstead from Hackney after 1881. He was an Associate of the College of Preceptors (ACP), a recognised teaching qualification. His wife was Elizabeth, from Banbury, Oxfordshire. They had no children in 1881. Dowling’s “classical and commercial Grammar school, at Heath Brow”, is mentioned in Kelly’s Directory of 1882. There is no trace of the family in the 1891 census; perhaps they were away on holiday? In Kelly’s Directory for 1890, he is in the commercial section under the entry for his independent Boxmoor School. By 1901, he is living at the same address, in Heath Lane, with his wife and 4 children, sister and niece as well as teachers, servants and students. He became well established in the town and was its last High Bailiff and provisional Mayor in 1896. He was present at the Public Enquiry into the affairs of the Box Moor Trust during that year and was strongly in support of the Surplus Fund which benefited both the town and Bovingdon. Heath Brow was not only a boys’ preparatory school at that stage, since he took pupils through to school leaving age and beyond and prepared them for the civil service and business careers. In the 1901 Census he was listed as a schoolmaster and, as well as his wife, had a daughter and three sons by that time. His widowed sister was the housekeeper and his young niece was also living there. There were five servants and two other teachers, with 35 pupils between 6 and 17 years of age. Some came from countries abroad, such as Burma, France and Spain, whilst the majority were from London. Only one boy, apart from his own children, is recorded as being born in Hemel Hempstead. In the directory of 1902 he was still at Heath College for Boys, Heath Park. In Kelly’s directory for 1906 and subsequent years there is no mention of him or the school. There are no existing records of Heath Brow College to our knowledge. Gerald Seth-Ward came later and ran his school as Heath Brow Preparatory School, which later amalgamated with Shirley House of Watford, becoming Beechwood Park, Markyate, in 1964. Hillside, later Heath Brow School, in Heath Lane, Hemel Hempstead. The name is still remembered in the vicinity by the road called Heath Brow, part of the redevelopment of the Vicarage and its gardens. Heath Lane was a popular location for private schools in the Victorian and Edwardian eras. 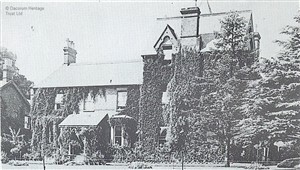 South Hall was still a private house owned by Mrs. Grimwood in 1886, Francis Lidderdale in 1902 and 1906, followed by the Birkbeck family. It was eventually pulled down, after a spell as a private girls’ school in the 20th century, with Miss Capstick as the Principal. It housed 50 girls aged 12 -18. Heath Lodge was then the home of the junior girls, aged 7 –12; Miss Minnie Capstick was at Heath Lodge in Kelly’s Directory for 1918. The state primary school called South Hill was built in the grounds in 1951. Part of the South Hall estate became an annex for Hemel Hempstead Grammar School, which was built in the 1930s on the opposite side of Heath Lane. This later became a Comprehensive School and is still flourishing today. The annex, called South Hill House, has since been demolished to make way for a block of flats. South Lodge still exists at the top of Charles Street, as a private house. The names of all these schools are so similar and quite confusing and it has taken many hours to unravel the changes.